Start on all fours.Line up your shoulders directly over your hands and your hips over your knees. Step back with the right, then left leg. Feet hip distance. Squeeze your legs, draw in through the belly, engage your chest muscles and feel your body slightly lift up from the ground as you engage the core. Keep your ears in line with the shoulders, do not let your head sag down. If you body starts to sag, come down to a kneeling plank. If wrists start to hurt, try kneeling plank or turn them slightly out. 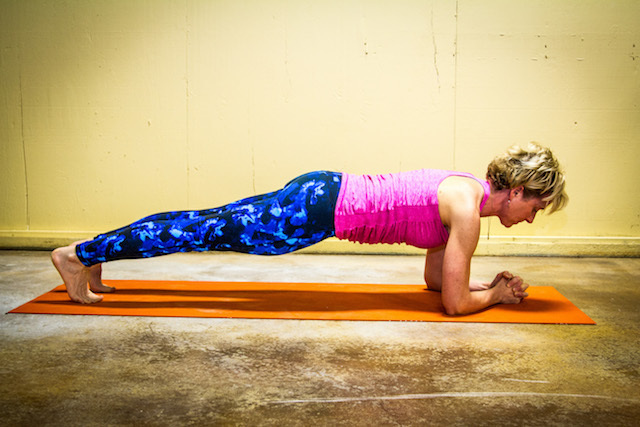 Hold plank for 5 - 10 breath cycles (cycle is 1 inhale/exhale). Remember in yoga we focus on building strength at our own pace, slowly to prevent injury. *For an additional challenge, come to forearms, interlace fingers and hold for 5-10 breath cycles. Do not practice plank pose if you are currently experiencing headaches, low blood pressure. Always work within your own range of limits and abilities. If you have any medical concerns, talk with your doctor before practicing yoga.